Guest post by Ian Greenleigh, the Social Media Manager at Bazaarvoice – the market and technology leader in hosted social commerce applications. He also blogs at Dare to Comment. There’s no doubt about it, those of us tasked with enterprise-level B2B marketing have some incredible hurdles to overcome. The business decision makers (BDMs) that have the purchasing authority for our products and services tend not to be involved very heavily—if at all—in social media. And although we might not discuss this fact very openly, the truth is that we can’t realistically expect anything we do in social media to directly lead to new customers when BDMs are involved. They aren’t reading our tweets, they’re probably not reading our blogs, and they’re definitely not Liking us on Facebook. But we have a secret weapon: Rocket Content. With rocket content, your end goal remains the same. Your job is to use social media to reach and influence decision makers at companies in your target space. The problem here is that many marketers see this path as a straight line—from them, to the BDM, to the purchase. This just isn’t how it works in the enterprise world. The missing link? The person that is most likely to understand and be excited about your company’s value proposition, the person that puts your solutions on the BDM’s radar. This person is far more likely to be engaged in social media, and they’re more likely to take the time to listen to what you have to say. If you can’t easily imagine your readers emailing what you’re writing to their bosses, it’s probably not rocket content. If your research shows that the prospects most likely to become closed deals are the ones that have downloaded your whitepapers, for instance, your content should be aimed at getting those whitepapers downloaded by people one or two steps below the BDMs at a typical prospect organization. People don’t keep good content to themselves, especially when it helps them appear smarter in the eyes of their superiors. Rocket content doesn’t even have to be read by BDMs to influence them. Employees might extract, rewrite and repackage bits and pieces of what you’ve written, or reference it in a hallway conversation with a superior. As long as the message you intend to convey makes it to them, you’ve done your job. The message is what matters, so make it sticky. 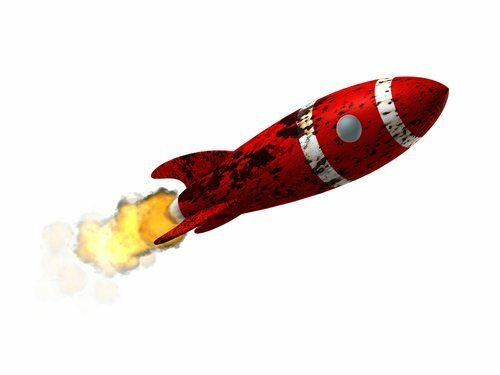 Often, rocket content is executive summary style, bullet point by bullet point, with a prominent call to action linking to a more comprehensive piece. This strategy works because you’re covered either way: If a BDM happens to find your content first, it’s brief enough for them to digest given their busy schedule. If someone under them finds it first, they can devote more time to reading the content you’re linking to. If all that mattered was traffic, B2B bloggers could write about Justin Bieber and win every time. But since we’re more concerned with numbers that actually matter—conversions, demo requests, downloads, etc.—we need to design rocket content, place it in front of the employees that act as decision support for their superiors, and let it make its way up the purchase path.